Big Fish Audio's Spring Sale Event Is Here! Up To 50% Off 1000's Of Libraries!Shop Now. Big Fish Audio's Spring Sale Event Is Here! Up To 50% Off 1000's Of Libraries!Shop Now. 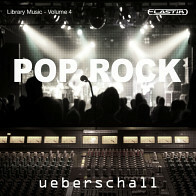 Bring some serious guitar bling to your tracks with “Pop Rockin' Guitars Vol 2”. 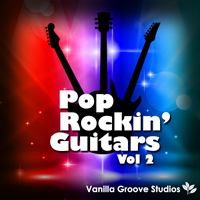 Featuring 38 blistering guitar loops arranged in 5 construction kits (including wet and dry mixes), ranging from 128 to 133 BPM, Pop Rockin' Guitars gives you the tools you need to build your next pop hit! *When ordering the download product from Big Fish Audio you will be given one or more links for each of your product purchases. The links will be active for 24 hours. During this time you should download the file and expand it. You can return to your Big Fish Audio account at any time and download your products. You will find your products in the "My Products" area of your account page. The Following End User License Agreement is included with Pop Rockin Guitars Vol.2. This License is only valid for the individual who has purchased an unopened, new and lawfully made copy of Pop Rockin Guitars Vol.2 from a dealer or distributor authorized by Big Fish Audio. The sounds contained in this product is are licensed (not sold) to you on a Royalty-Free, non-exclusive basis. You can use the sounds within this pack as part of your original music compositions for cds, dvds, websites, film, tv, games and other multimedia projects, without having to pay additional fees and/or royalties for this purpose. The license is granted for a single user only and is non-transferable (you cannot resell the product to someone else). Only the purchaser of this product is authorized to use the sounds within it. You are not permitted to resell these loops (either individually or in combination with other sounds) as part of any "Sample" or "loop" pack. Any MP3 demos of Vanilla Groove Studios products are not licensed for you to use in your music production. All rights by Vanilla Groove Studios." Thank you for joining our mailing list! Please check your inbox. Copyright© 2019 Big Fish Audio, Inc. All rights reserved.